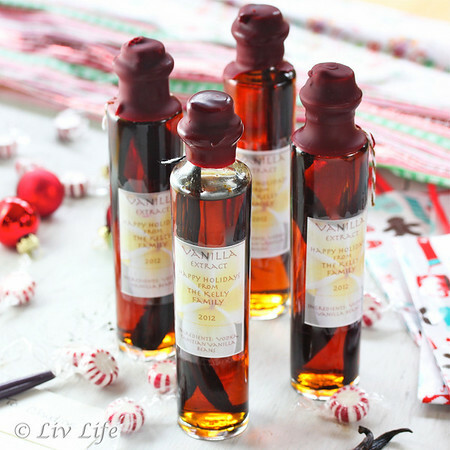 Liv Life: DIY Vanilla Extract... the perfect holiday gift (includes instructions on sealing and labeling). 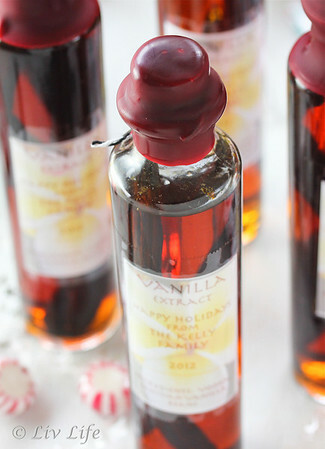 DIY Vanilla Extract... the perfect holiday gift (includes instructions on sealing and labeling). Planning ahead for the holidays is not usually my style. As a matter of fact, I've been known to do (not finish... but, do) my Christmas shopping on December 23rd. Nothing like waiting till the last minute! Occasionally though, I surprise myself as well as those around me, and make an ultra-organized move that makes me smile as it comes to fruition. Such was my organizational move this year to prepare DIY Homemade Vanilla Extract (See our September post for details on getting things started). Three months ago boxes of bottles and vanilla beans arrived at my door and had my husband raising an eyebrow at my latest project. This project though, couldn't be easier, and while you may be a little behind, you are not too late to put it together for holiday gifts this year. 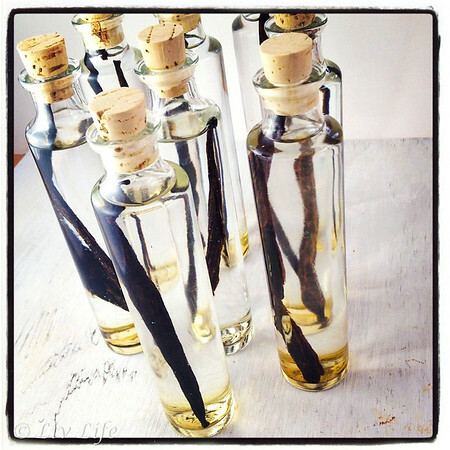 Vanilla extract comes together as one places sliced vanilla beans (we got our from Beanilla) into a clean bottle and then covers with alcohol - different alcohols and different vanilla beans bring varying flavors. This year our extracts feature one of two different beans. My personal favorite, the light and floral Tahitian Bean, lends a lovely lighter vanilla flavor to any recipe, while the more traditional Bourbon Bean brings a touch of richness and a slightly bolder, traditional note to the table. Filling most of our adorable little bottles (we got them for a good price at Specialty Bottle Company) with a good quality Vodka, the vanilla began to extract with in mere hours. Days later the liquid turned a light golden hue, and today, three months later, the bottles are ready with the deeper colors we expect from Pure Vanilla Extract. Note that the Bourbon beans seem to be bringing a richer, deeper flavor as well as color. Filling a few additional bottles with Maker's Mark Bourbon, this vanilla takes on an even greater depth as the bourbon alcohol brings notes of vanilla from the start. Rich and dark, this pure extract is wonderful in a recipe where you want the vanilla flavors to really shine. Our bottles closed with corks, and over the three months we did notice a bit of evaporation in a few. As such, a little online research showed me how to cover the bottle tops with a bottle wax providing a moisture-resistant coating which also preserves freshness, flavor and fragrance as well as giving our bottles a beautifully finished look. My research let me to Midwest Home Brewing and Wine Making Supplies out of Minnesota where we chose the burgundy color, but the little wax beads come in a multitude of colors for your every occasion. To make the wax easy to remove, Liv and I wrapped a bit of baker's twine around the cork and around the top of the bottle, and then down the side, leaving enough to have a bit of twine hanging below the wax. Securing the twine with tape (to make dipping easier) our bottles were ready to dip, and we found the twine to work wonderfully as a little "pull tab" to cut through the wax when one is ready to open the bottle. Attempting to ease clean up, we poured the wax beads into a clean and dry can and placed it over medium heat on the stove in a pot of water. Similar to melting chocolate, the boiling water was enough to melt the wax, though you might note that it took about about 10 minutes for the wax to become completely liquid. Please take great care when using the hot wax as it can cause serious burns if spilled onto the skin. Once melted, carefully remove the wax can from the water and place on a sturdy surface, like a counter. Check to make sure your corks are very secure and then dip the bottle into the wax as far as desired, then remove slowly keeping the bottle facing downward so the wax does not drip down the sides of the bottle. 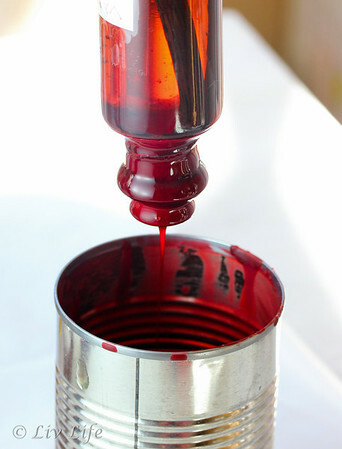 Alternatively, turn your bottle upright and tilt and twist to allow the wax to drip down the sides. Once the wax stops dripping, place the bottle on your counter to set. We gave ours a second dip for a thicker wax coating. Next up, a nice finishing touch is a label. While I designed and printed labels directly from my computer onto packing labels, templates are available online with a little searching. I did find that our labels stuck beautifully onto the glass bottle for about 20 minutes, then corners began to lift, and before I knew it, the labels were popping off all over. My best idea had me placing a piece of clear packing tape over the labels giving a nice water proof cover and a good stick, but not the most beautiful finish. Next year I hope to have a better labeling idea! If a label is not your thing, a piece of baker's twine with a little card hanging off the cork could be an alternate decorative and festive way to go. Our vanilla extract "brewed" for about 3 months, and while I felt it was ready, I wouldn't mind it a touch stronger. To beef up the vanilla strength, our extract uses 2 beans to about 4 ounces of alcohol, and if you want to give these welcomed little gifts this year, you could simply write a little note saying explaining that the extract will be ready in March. So pretty and I love the sealing wax on top~gorgeous touch! So pretty and so creative! Beautiful presentation! I've been wanting to do this as well. I too have been meaning to do this! Question: do you have a site where you recommend getting the beans for a good price? This is just awesome! Can i do this with other things? like lemon, orange, cinnamon etc.? What vodka did you use? I was curious if the better vodkas make a difference. Stoli vs Grey Goose. let me know what you decide and how it works! 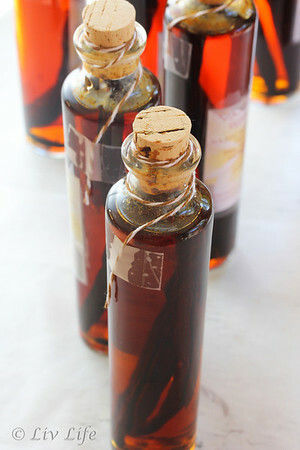 I did vanilla extract for Christmas gifts! I got my beans at Indrivanilla.com because they carry bourbon vanilla beans for $0.50 each... they're even cheaper than that if you buy them in the half-pound or full pound quantities, like thirty cents each. Their stuff is fair trade and organically grown, too, and single-estate. These are so lovely. I was wondering though, do the bottles need any special pre-prepping, such as sterilizing them prior to use, or does the alcohol take care of that? Robin... I did run my bottles through the dishwasher, but I'm guessing the alcohol would probably take care of any issues! I always wash though, just to be safe. so when ready to use, do yu discard the beans, or just leave them in forever? I keep them in there!! I actually stick more beans in the jar as I use the throughout the year, then top off with vodka occasionally. So far I've added just a couple of beans to mine and topped off twice. My daughters and I have our day planned on making 30 bottles to give as gifts to our coworkers. We bought from all the stores you mentioned on the article. Thank you for making this so easy to do. So looking forward to tomorrow !!! So exciting!! I haven't started mine for the season yet... you've got a good head start! You are so welcome. We'd love to see a photo of yours when you finish! Happy Vanilla! Update: A successful day. We used green wax. Can hardly wait to share come the holiday time. Thank you for sharing this project. Yay!!! The green wax will look lovely for the holidays. Everyone is going to love them!! You're very welcome. Thanks for letting me know how it went! I love this idea. Did you slice the beans in half? How many pieces per bottle did you use? Do the beans leave floaty particles in the bottle? Thanks for sharing!!! 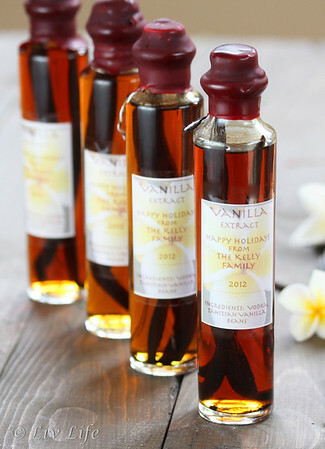 What is the shelf life for your vanilla extract? Thanks again for the inspiration! Thank you for posting a good article with those clear picture so I can really understand how it works. I've always thought about doing this, but now you've upped the game with those gorgeous handmade labels. It's a great gift!